Shito Negussie pours coffee during one of her daily ceremonies. To see Shito Negussie emerge from the back of Abugida Ethiopian Café in a flowing, pink and white traditional Ethiopian dress — called a habesha kemis — before sitting down in front of 18 empty coffee cups, a basket of popcorn, a jebena in which to brew and pour the coffee and a bowl of burning incense is to realize you're not at Starbucks anymore. To taste the results is only to confirm that fact. At least once a day, Negussie or someone at the café goes through the traditional process of brewing Ethiopian coffee, which starts with something you're not likely to find at any corporate chain or local coffee shop in town: green, pre-roasted coffee beans. Yodite Tesfaye, Negussie's daughter, was taken aback when she moved to the United States and realized that nobody used pre-roasted coffee. "I noticed that," Tesfaye says. "I went to a coffee shop and this lady had never seen coffee without being roasted. I was so shocked." Negussie celebrated the Ethiopian New Year at Abugida on Sept. 10. 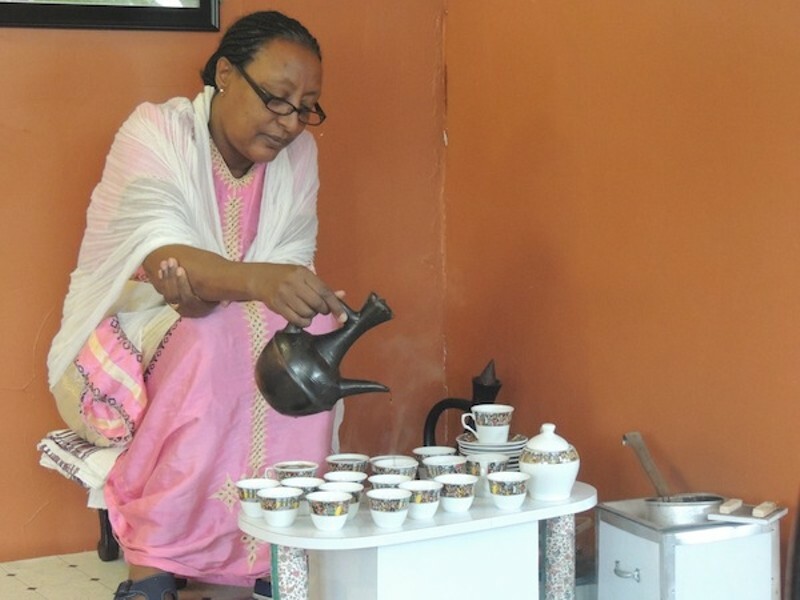 Tesfaye, who runs Abugida with her mother and younger brother, Zemas, has lived here for nearly two decades, and now when she returns to Ethiopia to visit, she notices the roasted coffee trend popping up there, as well. "Back home, now when I go back, I see coffee roasted and being sold," she says. "But before, you never saw coffee that was pre-roasted. You go to corner stores and they just sell the fresh coffee, never roasted coffee. Now I went back and I see packs of roasted coffee and I'm like, 'Things change.'" 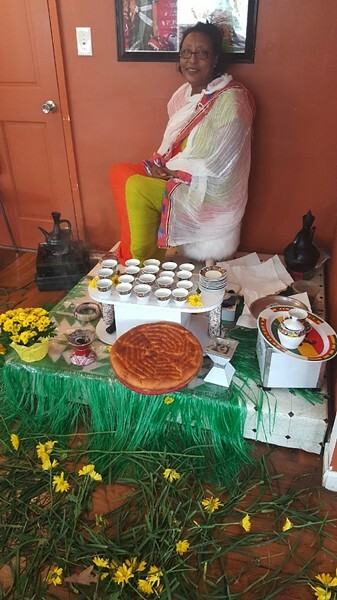 Soon, however, customers will be able to find pre-roasted coffee for their homes, as well as an array of different Ethiopian goods, when Yodite's older sister, Roza Tesfaye, opens Balageru Ethiopian grocery store with her husband right next door to Abugida. The soft-spoken Roza hopes to continue helping to serve Charlotte's growing Ethiopian population while teaching the culture to those unfamiliar with it, a process her mother and siblings started with the opening of Abugida in February. Roza says the idea came as Abugida customers continued asking where they could find ingredients to make some of the traditional Ethiopian meals they were ordering there, and the staff didn't have an answer for them. "Charlotte didn't have that much Ethiopian people before," Roza says. "Now we've had a lot of people move to Charlotte. So, those people, they need stuff. They go to D.C. or Atlanta to get it. So now we will open and the people are happy, and they're Abugida customers, too, so that's why we open there." The store will be a godsend to her siblings, as well, who use strictly fresh meat seasoned with Ethiopian-imported ingredients at Abugida, but currently have to drive to South Carolina to get most of their spices and other foods. "Either we go get [our meat] from the farms, or there is one supplier that supplies fresh everything, and we get it from them," Yodite explains. "We don't do anything that is pre-packed. [Roza and her husband Kassahun Habteslasea] are going to actually go to the farms and do everything fresh. So we're just waiting for them to open, because right now I have to drive all the way to South Carolina. I won't have to go all the way down there." Yodite and her family are no strangers to traveling long distances in the interest of getting what they want. Negussie came to America in 1995 with one goal: sending for her four children to join her and attend college in the States. Three years later, the children left Ethiopia, where they had lived with their father, to join their mother. Yodite, who has an older brother along with Roza and Zemas, was 15 years old and hated attending Independence High School. "In high school, oh it was hard," Yodite says. "I told my mom to take me back. I was the one who rebelled. For my little brother, it was easier to adjust because he was kind of young, so he adjusted, but for me, I kind of remember what's going on back home, so when I come to a big high school not knowing the language, and the crowd is different, it was really a tough time. I did not enjoy my high school at all." Once she graduated, she returned to Ethiopia. She knew, however, that her mother did not want to live in the United States, either, but that she moved here and made sacrifices in the hopes that her children would attend college. The guilt was enough to convince Yodite to return to Charlotte, where she enrolled at Central Piedmont Community College and later graduated from Winston-Salem State University. She now considers the United States, and Charlotte in particular, her home and has no plans to leave. Yodite had always wanted to open an Ethiopian coffee shop, and began to make plans to do so after college, but she was overlooking her ace in the hole. "My mom, people were always telling her to open a restaurant. Because at church, at events, she always cooked, and everybody loved her cooking, but she was always by herself raising four kids, so she couldn't do it," Yodite says. Negussie had opened Al's Mini Mart with Roza in west Charlotte, but the family was ready to expand, so Yodite brought her mother on to help out. "My passion was just to have a coffee shop, but everybody was like, 'You've got your mom. Why would you want to just have a coffee shop? Why would you do that?' So I said, 'Yeah, why don't we use her while she's here, to teach us what she knows.'" Negussie still plans to return home to Ethiopia eventually, but until then, she is right at home holding coffee ceremonies at Abugida. In the Café, Negussie roasts the beans while mixing them in a pan before beginning the three-step brewing ceremony that's crucial to the social culture of Ethiopia. The first round, called awel, is the strongest. As Negussie brews the second round, kale'i, she adds more water. The third round, baraka ("to be blessed"), is the weakest, and basically serves as a reason to keep people at the table and socializing. Abugida's vegetable plate is the cafè's best seller. Soon after the coffee is served comes the food, which begins as a large circle of teff bread on a pan. The teff, a spongy bread native to Ethiopia and only recently grown in Australia and parts of the United States, will serve as both the plate and mode of conveyance for the meal. Folks around the table use their rolls of teff or pieces picked from the round plate the food sits on to transport the food to their mouths and soak up the scrumptious sauces left behind. 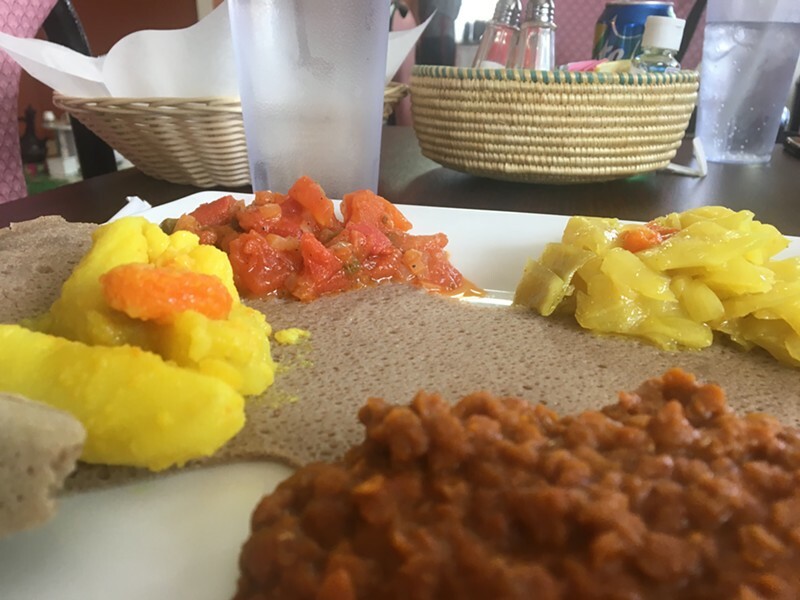 Surprisingly for Yodite, the restaurant has attracted a large number of non-Ethiopian customers during its first year, and all of them seem to enjoy the food, though some have trouble getting past the fact that they have to eat with their hands. "People, at first they get hesitant and say, 'Give me a fork.' I say, 'OK, I'll give it to you, but if I were you, I'd eat with my hands.' Then they'll try one or two times and kind of get used to it." The first woman to freak out, by the way, kept coming back because she loved the food so much. She's now a regular customer, and no longer requests silverware. It just proves something that Yotibe's family has known for decades: to get what you want, sometimes you have to get your hands dirty.